Well, my friends I went out again today to find the best cinnamon roll we could here in Portland. I have Googled it and have kind of come up empty handed. I have asked questions in the Yelp community and still not a lot. After much research we were ready for the 2nd attempt at finding the best cinnamon rolls in Portland. If you missed the first attempt check out our reviews from the first three contenders. Today we went to Grand Central Bakery, Kens Artisan Bakery, LoveJoy Bakers and finally back to Fat City just for comparisons sake. It’s research people, we want to do it right. Grand Central Bakery has quite a few locations but we chose the NW location. If you drive by 3-4 times and don’t see it, just call. It’s very hidden, but a very cool place once you find it. 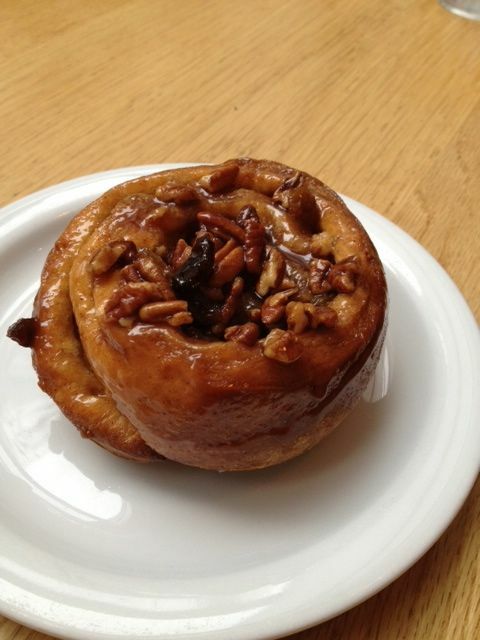 We had heard about their cinnamon rolls from reading reviews and even a few suggestions. We order 2 of them for the 3 of us and sat down. 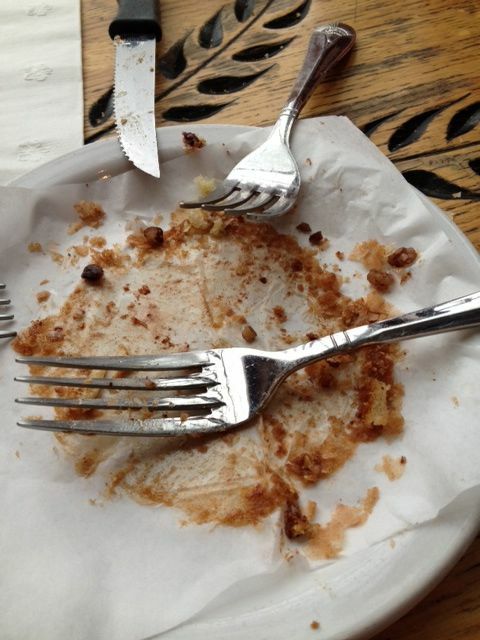 We were so taken back by the crunchiness of it we forgot to take a picture. If you are a cinnamon roll connoisseur you will know that crunchy is not a good description. They were baked individually, meaning they aren’t gooey from them all baking together. Because of that they were very crunchy on the outside. Well, not just crunchy, I looked over and my friend was gnawing on it. You had to use a knife to cut it, there was no way you could use just a fork. It had little raisins or maybe currents, we weren’t sure. There was absolutely no frosting whatsoever and it didn’t have a super cinnamon flavor. As we left we all gave it a 1 out of 5 stars. BUT…This would be a great place to get a sandwich for lunch or even a breakfast sandwich. I think everyone also knows they are known for their bread, so give it a try. I loved the location of this one and will definitely make my way back for some other food treats, just not the cinnamon roll. As we wondered in I realized that I had been here once before years ago and gotten a sandwich. I also really remembering loving this place, so I was super excited. The excitement did die quickly when we noticed that this one too was also baked individually with a crunchy, or crusty might be a better word, outer shell. Nonetheless, we ordered it, had it warmed slightly and took our seat. The first thing I noticed when I bit into it was the dough was not a super sweet dough. The nuts were super good, we all like nuts. There was no white creamy frosting, but there was a frosting of sorts and very little cinnamon. Even when we got to the middle it wasn’t gooey. This was definitely better than Grand Central, but not much. As we were leaving I noticed 2 things. First it definitely had the European flair, which means the pastries won’t be sweet. So although it wasn’t to our liking, they did nail that part perfectly for a European pastry and I also noticed this incredibly delicious looking open faced sandwich someone was eating we walked out. We all stopped and made comment about it. So even though your cinnamon roll wasn’t the best, we will be back for some other great food. That sandwich…I’m coming back for that sandwich. I have been here before and enjoyed their breakfast sandwiches, but I had never tried any of their pastries. I even had someone say to me if their other stuff is that good, then the cinnamon rolls will be too. When we got to the counter we quickly realized that they only had pecan rolls, not cinnamon, but since we all like nuts this was not a deterrent. We grabbed one of those, again slightly heated, and a cup of hot tea. As we bit in we all said the dough did not have a good flavor. None of us could put our finger on it, but we all agreed it just wasn’t right. It was also very, very dry. It too was baked individually so not only tough on the outside, but dry on the inside. It also had raisins, very big raisins. I don’t like raisins. Overall disappointment. At this point we had hit all the places we intended on hitting, but we didn’t find THE cinnamon roll. Wendy and I knew that Fat City has some of the best, so we decided to go there just to end on a good note. Check out the size of this cinnamon roll. Dang! Since it was getting late in the day we decided to call and make sure they still had some and sure enough they did. We roll in, grab a seat and order right away. They said they were expecting us. Gotta love that. I knew they were big, but she brings out this ginormous cinnamon roll. We’ve had it, and we know it’s good. It wasn’t as gooey as usual, but still super scrumptious. We all took huge chunks, I mean HUGE chunks. Everyone got some of the extra gooey middle and the great cinnamon and the just enough frosting on top. We did it, we ended the day on a high note. We also ended it where my last post ended. 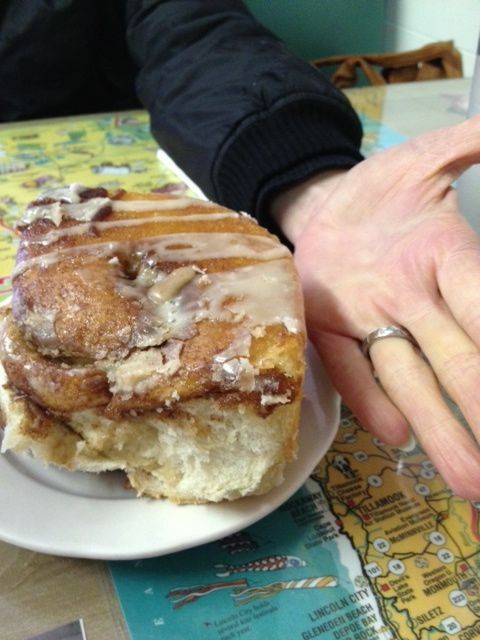 Fat City has the best Cinnamon Roll in Portland. We gave this one a 4.5 outa 5 stars today, just a little dry. But we know from past experiences that they are normally 5 outa 5. I think all the plates the cinnamon rolls were served on were about the same size. That will help you see the HUGE difference. Check out Take 2, as we continued our search. 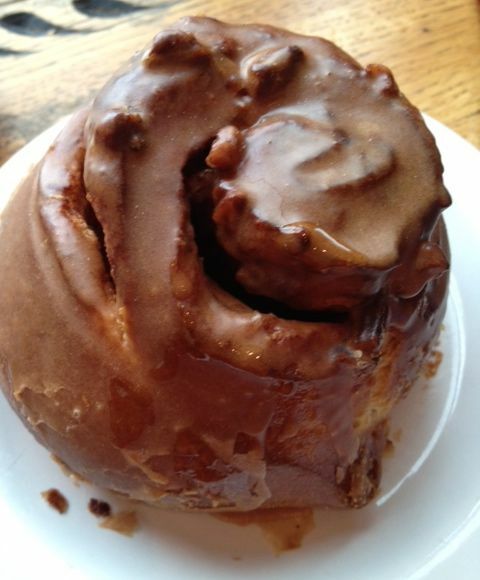 So, after much….er…”research” myself, hands down, the BEST cinnamon rolls are found at Dovetail Bakery on Alberta! I am by no means vegan, or even vegetarian, so you could imagine my surprise at discovering this. They are the ultimate perfect texture oh gooey Godliness with the sweetness of baby angels- this coming from a non-religious gal. I am a Dovetail convert who’d drink the kool-aid if it came with a Dovetail cinnamon Roll. Adding it to my list. Thanks for the tip.